Crab cakes are always a popular pre-reception menu choice, so I thought I'd share one of my favorite recipes! Try this at home and I'm sure you'll soon be adding these to your cocktail hour menu! In a large bowl, stir together 2 cups of the bread crumbs, the crabmeat, red onions, red and green bell pepper, scallions, mayonnaise, poblano chile, egg yolks, lemon juice, parsley, 3/4 teaspoon salt, 1/4 teaspoon freshly ground pepper, and the cayenne pepper. Form 28 crab cakes, using about 2 tablespoons crab mixture for each, and shaping to about 1 1/2 inches in diameter. On a plate, stir together the flour and the remaining 1 teaspoon salt and 1 teaspoon pepper. In a shallow bowl, with a fork, lightly beat the eggs. Place the remaining bread crumbs on a plate. Dip each crab cake into the flour, shaking off the excess, then into egg, shaking off the excess, and finally into the bread crumbs, shaking off the excess. Place the crab cakes on a wire rack. In a 12-inch skillet, heat 1/4 cup of the vegetable oil over medium-high heat until hot but not smoking. Add the crab cakes, in batches, and cook for 3 to 4 minutes on each side, or until browned and crisp. 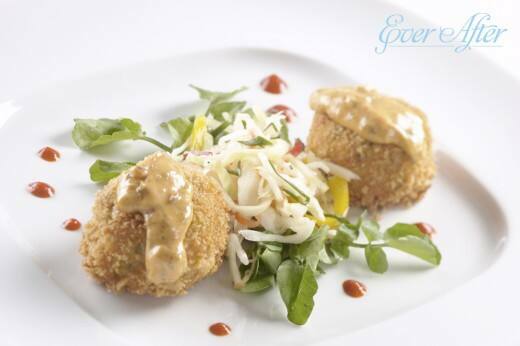 As the crab cakes are cooked, remove them with a slotted spoon and drain on paper towels; keep warm. Repeat to cook the remaining crab cakes, adding more oil as necessary. Serve hot with a Chili Remoulade.